1. Holding a Large Portion of Your Savings in Just One or Two Stocks. Even if they are performing well today (or for years), if there occurs a major downturn in the companies' businesses due to scandal or otherwise [remember Enron? ], the stocks could plummet overnight. This is just one reason you need to diversify. 2. Failing to Diversify, But Believing You Did. Many investors believe that owning five or six mutual funds means there portfolio is diversified. More often than not, however, they have purchased similar mutual funds, meaning they will all rise and fall in tandem. If you like mutual funds, invest in more than one and make sure each covers a different asset class, such as money market, bond or fixed income, stock or equity. 3. Investing Your Retirement Funds Based on a "Hot" Tip. Chances are the tip is not so hot; everyone knows the supposed inside information; and the price reflects this common knowledge. 4. Putting Too Much of Your Retirement Savings in Bonds on the Assumption That They Are Safer than Stocks. While bonds are less volatile than stocks in the short term, stocks are less volatile over a 30-year or longer period of time and have out-performed bonds over every 30-year period for many years. Moreover, bond prices fall when interest rates increase. Given that interest rates have been at historical lows for nearly ten years, the odds are great that rates will increase over the next few years, thereby depressing bond prices. 5. Allowing Your Money Manager to Also Serve as the Custodian of Your Retirement and Investment Funds. If your money manager proves to be a scoundrel, your funds are in jeopardy of vanishing via embezzlement, a Ponzi scheme, or other improper activity if your money manager is also the custodian. Keep the money manager and custodian functions separate. 6. Paying Excessive Fees. Even a small difference in fees can make a huge impact on the amount of money you will have in the long run. 7. Relying on Set Asset Allocations Based on Your Age. While talking heads frequently suggest this one-size-fits-all approach, we all age differently. Some of us are able and healthy long past age 60 and have a family history of longevity, while others of us have not been so fortunate. Make sure your asset allocation is consistent with your own personal circumstances. 8. Buying Stocks When the Market Is High, and Panic Selling When the Market Dips. If you buy when the market has already been on a long upward trajectory, chances are it may be at or near its peak, leaving only one direction for the market to go: down. If you then panic sell [what most investors do], you will take a bigger hit than if you wait for the inevitable market correction. Instead, consider buying after a big market dip, as that is when you can swoop up the bargains. But remember, it is virtually impossible to time the market. Therefore, if you have a well diversified portfolio, it is often best to just stay the course and do nothing. 9. Buying Annuities You Do Not Fully Understand. Many annuity contracts are actually insurance policies with complicated terms and conditions that are difficult to decipher. While annuities promise a steady income for life or a set number of years [an attractive arrangement for most of us], they are generally illiquid unless you pay a high surrender fee to cancel. This could be a problem if you suddenly need the cash. Annuities also typically come with fees and expenses that can impact the return on your investment, and the annuity contract may even allow the insurance company to "reset" the return. Further, the annuity might not come with inflation protection; so, if the monthly payment is a fixed amount, it has increasingly less purchasing power over time. Finally, the annuity may not provide a survivor benefit, which could leave your spouse in a financial bind when you pass. I'm not saying "Don't buy annuities." I'm saying make sure you carefully read and fully understand the fine print in the annuity contract before you make the annuity investment. 11. Failing to Include Foreign Stocks in Your Portfolio. While U.S. and foreign stocks generally perform equally well over time, their relative positions tend to change often and irregularly, meaning that U.S. stocks may be up while foreign stocks are down, and vice versa. Therefore, it makes sense to include foreign stocks in your portfolio to reduce volatility and smooth returns. 12. Making Investment Decisions Based on Your Political Views. While politics surely influences the stock market, data going back to 1925 confirm that neither Republicans nor Democrats are inherently better or worse for the market. So, don't make investment decisions based on which party is in power or your personal political beliefs. 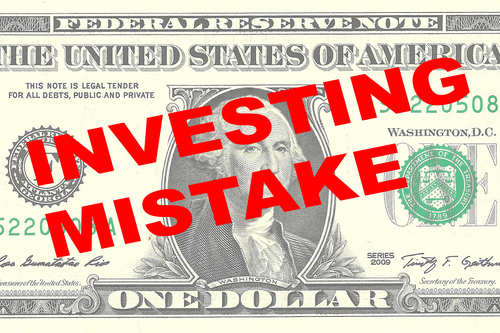 Hopefully this dirty-dozen list will help you avoid at least a few of the more serious retirement and investing mistakes. However, if you are still uncertain as to how to proceed, I suggest you consult a fee-based (rather than commission-based) financial advisor. To read more posts about retirement issues, please go to my Facebook Page "Pension Justice 4 You" and if you like it, share it with your Friends!